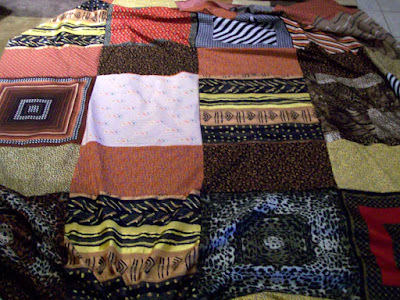 I cut 15 squares from my scarves that are 20"x 20", and then cut 20 squares that are 20" x 11" from a couple of my fabrics. I attached lightweight fusible interfacing to the back of the scarves as they are alot more fragile than the cotton fabrics. Today, I sewed all the squares together. For the most part, it went quite well; which surprised me. This is just my second project that involved blocks ... the first didn't go too well. I'm also liking the overall look. The furniture is coming on Saturday, we are doing the room details and painting tomorrow, so hope to finish this on Friday. Beau said he'd help me pin it all together.